The poem itself, through its language and through the activities it describes, promotes a particular kind of religious practice. This practice, rather than revolving around the church or matters of doctrine, is rooted an appreciation for the natural world. 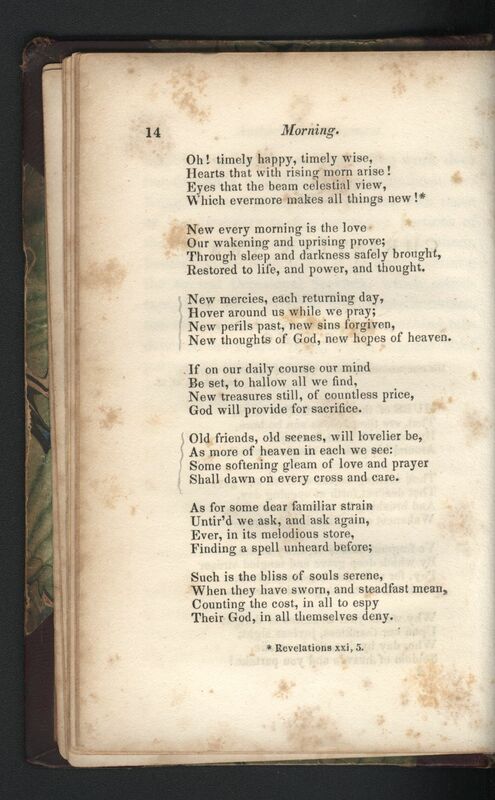 At the start of the poem, God’s role is imaginatively occupied by the sun: the poem addresses the morning itself, asking why the dawn wastes its goodness on those who “seldom of heaven and you partake” (line 16), conflating heaven with the sunrise. The sun is then described as “the beam celestial […] / Which evermore makes all things new” (19-20), and the footnote in the original text directs the reader to a passage in Revelations in which this task is ascribed to God. The poem’s view of religious practice is also highly domestic. A faithful heart will find a reward in “Old friends, old scenes” that are made “lovelier” (33), and not just in the glory of heaven. As the poem moves on to promote “sacrifice” (32) as the path to virtue, it is careful to note that this sacrifice does not require isolation in a “cloister’d cell” (59), but can instead occur in the context of “Our neighbour and our work”(50). The poem’s closing request to God—“help us, this and every day, / To live more nearly as we pray” (63-64)—reinforces its final focus on life, rather than the afterlife. The poem also suggests that the foundation of this natural, domestic religious practice ought to be daily reflection—a suggestion that serves to instruct the reader on how to read The Christian Year itself. 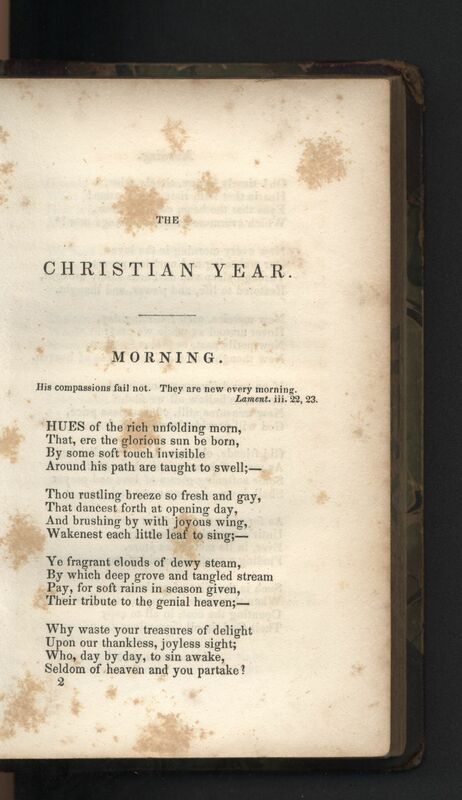 The poem focuses on God’s love and on the individual’s faith as something that is present “every morning” (epigraph; line 21), “each returning day” (25), “on our daily course” (29), “daily” (54), and “this and every day” (63), establishing religious devotion as something that can be acquired as a habit. The poem’s own role in that habit is implied in its contextual presentation as “improving” literature. The opening biblical epigraph establishes from the first that the poem will treat on moral topics. 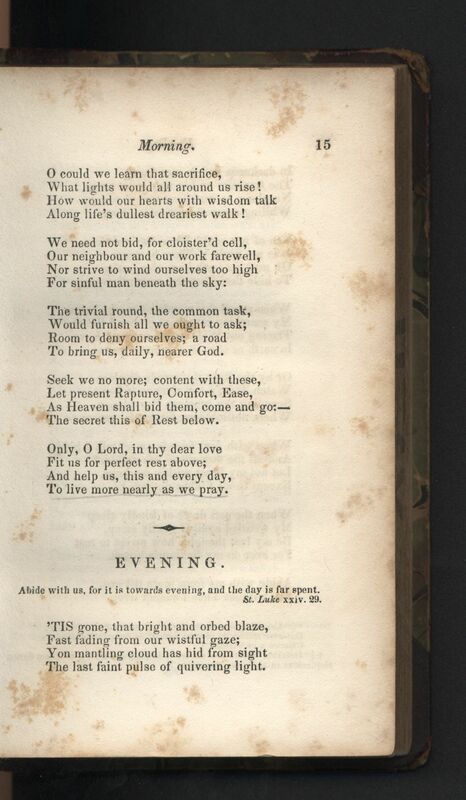 The footnoted reference on the second page, directing the reader to further biblical study, further emphasizes the poem’s goal of advancing its audience’s religious education. Both reinforce the purpose of the volume as a whole: to be read in installments each week, as part of a habit of religious reflection. Seldom of heaven and you partake? Hearts that with the rising morn arise! Along life’s dullest dreariest walk!